My relationship with Star Trek and its offspring is turbulent. I enjoyed a brief, intense love for the original series in my teens but it didn't last. I saw a chunk of Star Trek: The Next Generation, but was never a regular watcher. For some reason as I grew older Star Trek was a corner of the geek kingdom I shunned. I thought the few episodes I caught here and there were formulaic, boring, and pandering to fandom. Recently, I grew curious. Maybe it's because so many friends whose opinion I respect love at least one of the series. However, no offense to my friends, the fact that I can stream all of the episodes of most of the series on Netflix helped facilitate my curiosity more than anything else. I found myself watching the two-part "The Best of Both Worlds" from The Next Generation in which Captain Picard is absorbed into the ranks of the Borg. A few snarky tweets later and fellow bloggers Tim O'Neil and Alan Doane were responding. 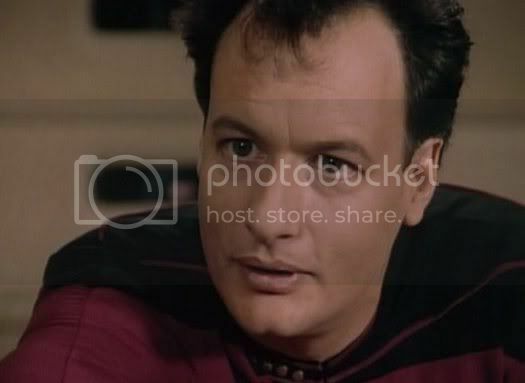 After O'Neil tweeted that he's meant for a while to write a top 10 list of his favorite TNG episodes and I responded with "I'd be interested to read that. I don't think I can even think of 10," Doane responded with a list of 21 TNG episodes he thinks are "great, and enjoy watching again and again." So, since the Netflix is already paid for and all I have to do is click a button, I decided to go down Alan's list and blog about what I thought of the episodes. I originally wanted this to be a series of 4 installments, but I decided I had more to say about some of the episodes than I originally thought. So, as of right now, all I can say is that it will take as long as it takes. While I’m blogging about Star Trek: The Next Generation here, I’ll also be talking about the problems I had with the series over at List SMASH! Starting with today’s Top 10 Things I Hate About Star Trek: The Next Generation. The Enterprise is en route to greet a race of grammar-nazi aliens, the jaradan. Little is known of the jaradan other than their powerful technology and their insistence that any race opening negotiations with them recite a pitch-perfect greeting in the jaradan’s own insectoid tongue, or whatever insect people have in place of tongues. Captain Picard exhausts himself learning and practicing the greeting and Counselor Troi insists Picard decompress on the holodeck. Picard chooses to step into the shoes of Dixon Hill - a hard-boiled detective whose adventures Picard followed as a child – and he brings Data, Dr. Crusher, and the historian Dr. Whalen with him. While the four of them stumble and giggle through this cartoonish version of early 20th century Earth, the Enterprise reaches the borders of jaradan space and the aliens’ scanning equipment unintentionally damages the ship. While the damage is negligible for the most part, for the holodeck it’s disastrous. 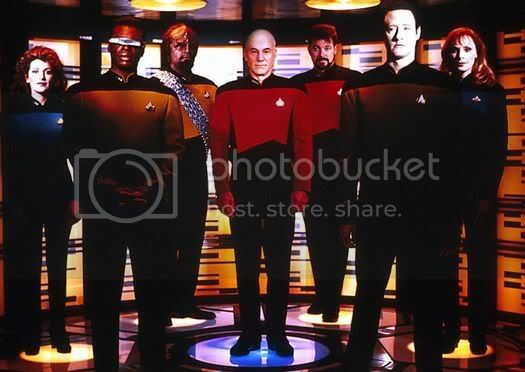 Picard and co. cannot leave the holodeck and the safety protocols are off. Dr. Whalen is shot by a weasely character and lies dying on Dixon Hill’s office floor, and in the meantime the jaradan grow restless with Picard’s absence. I always had problems with the holodeck episodes and “The Big Goodbye” is the very first of them. There were the minor issues most fans would likely dismiss. I find it implausible a military vessel would be equipped with something that has the potential to be the most immersive and addictive diversion every created. Even if it were, I think eventually the thing would be jettisoned once it became clear that something always goes ridiculously wrong with it, and it ends up threatening the ship and her crew every few weeks. But I also tend to dislike them for the same reasons Trek fans adore them. The holodeck episodes are often used to pay homage to different genres and put the heroes in settings that wouldn’t make sense otherwise. And whenever Star Trek pays homage to different genres, I tend to feel the same way I would if Celine Dion threw together a Led Zeppelin cover album. It’d be really nice of her and everything, but it’s best if she just left it alone. Star Trek never seems to get it right. They cornball-ify whatever they touch, and to try and tackle the hard-boiled detective genre as they do in “The Big Goodbye” just seems freaking ridiculous. You couldn’t get much further from the world of Philip Marlowe and Sam Spade than the Enterprise crew, and my whole being just groaned at the thought of those worlds colliding. I did not want to say about the first episode I covered here “I was surprised at how much I liked it.” I mean, that’s exactly what you expected, right? Well, I’m sorry. It’s true. I liked “The Big Goodbye” and that surprised the hell out of me. Now, there are some things I didn’t like, but mostly because the hard-boiled detective genre is one I feel a little proprietary toward. I wouldn’t call myself an expert or even a well-read connoisseur, though it’s a genre I’ve been gravitating toward slowly but passionately. We learn, for example, that Dixon Hill was Picard’s childhood fictional hero and that didn’t ring true to me. The gumshoe detectives of Raymond Chandler and Dashiel Hammett aren’t the kind of heroes kids are attracted to. A couple of times, Dixon Hill is referred to as a 20th century Sherlock Holmes, and characters like Marlowe and Spade – upon whom Hill is clearly based – were nothing of the sort. That’s part of what makes them “hard-boiled.” They were by no means stupid, but they weren’t deductive geniuses like Holmes. Sure, they used their brains, but their main strategy was to cause as much trouble as possible and see where the ensuing shitstorm led them. Overall, while we’re led to believe the holodeck program in “The Big Goodbye” is based on hard-boiled novels, it’s clear that the episode pays homage more to the Hollywood adaptations of those novels. Surprisingly, in a way the discrepancies help the episode. As they tour their fictional construction of 20th century Earth, Picard, Data, Crusher, and Whalen come off like condescending American tourists visiting a less affluent country and just tickled pink by its strangeness. Data and Whalen spout off dumb lines in silly accents. Picard can’t stop smiling and complimenting the holodeck characters as he’s grilled by an angry cop in an interrogation room. The holograms seem almost sad about how little Picard and co. take them seriously. So the fact that “The Big Goodbye” is clearly not a perfect homage to the hard-boiled genre kind of fits. The creators are giving the genre as little serious attention as the Enterprise crew, until of course Dr. Whalen is shot and everyone starts taking things very seriously. Also, the incongruity between the genres mirrors the challenges the Enterprise faces with the jaradans, who want Picard to deliver things perfectly, just like the holograms (and apparently just like this reviewer). “The Big Goodbye” is perhaps the funniest episode of Star Trek: The Next Generation I’ve seen (at least, in terms of episodes that were intentionally funny). Picard’s beaming, childlike glee with the hard-boiled holograms is hilarious, and something I can’t remember being reproduced again in the series. Even a simple, predictable joke like Picard’s reaction to taking a drag from a cigarette is classic. The funniest moment is reserved for the end, when Picard finally escapes the holodeck and delivers the long anticipated greeting to the jaradans. The jaradans are handled exceptionally well I thought, and with minimal treatment. You never see the jaradans, their ships, or their cities. You only hear the voice of one, who sounds a bit like Gozer from Ghostbusters. The director lets your imagination run wild in a way that is exceptionally refreshing for a show like TNG. Perhaps it’s a minor thing, but I love the title. It’s a mash-up of the Raymond Chandler novel titles The Big Sleep and The Long Goodbye, and there’s a clever irony about it (since of course, the episode culminates not in a Big Goodbye but a Big Hello) that you don’t often see in the titles of TNG episodes. The next episode on Alan's list is another holodeck-gone-wrong episode, but this time set in a fictional 19th century. With some time to spare, Data and Geordi La Forge decide to have some fun on the holodeck immersed in a Sherlock Holmes novel, with Data playing Holmes and Geordi as his partner Watson. Geordi is quickly fed up when he realizes Data has no intention of going through the entire story. 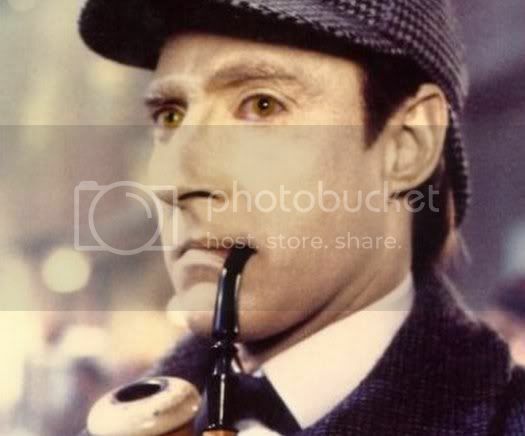 With an encyclopedic knowledge of the Holmes mysteries, Data simply solves the case as soon as it begins. The annoying fill-in for Dr. Crusher, Dr. Pulaski, overhears Geordi trying to explain the problem to Data and assures Geordi it’s no use: Data’s just a toaster oven who knows cold facts but can’t solve an original mystery. Data takes this as a challenge and all three enter the holodeck, this time asking the computer to create an original Holmes mystery. The mystery is simply an amalgam of Holmes stories, however, and Pulaski calls BS (actually she just stands there and says “Fraud! Fraud!” in a really annoying way – I don’t like her). Wanting to settle the challenge once and for all, Geordi instructs the computer to create an adversary capable of defeating Data, and hence lays the foundation for this particular holodeck-gone-wrong. The computer decides the only way to create such an antagonist is to imbue Professor Moriarty – Holmes’s nemesis – with sentience and the understanding that he is a hologram. Moriarty learns as much as he can about the vessel he’s on, and is determined to be let out of Enterprise’s life-sized video game. "Elementary, Dear Data" is an interesting episode and I have mixed impressions about it. If you remember what I wrote about "The Big Goodbye," then you probably already realize in regards to winning me over, "Elementary, Dear Data" has a lot working against it right off the bat. It’s a holodeck episode and it’s a genre-crossing episode. Still, once Moriarty kidnaps Pulaski and Data and Geordi realize they have a genuine, challenging mystery to solve, their sense of adventure is infectious. They throw themselves into it, though eventually it disappointed me. I got the sense that what I was in for was a full episode of Data and Geordi working on a Holmes mystery and that their success or failure would determine not only the fate of Pulaski, but the ship. But that isn’t what I got. Once Data and Geordi confront Moriarty and realize he’s attained sentience, the episode shifts gears. The game is officially over and the pair leave to inform Picard. Moriarty has somehow constructed a lever that briefly knocks Enterprise around just enough to get Picard’s attention. Picard enters the holodeck with Data to face Moriarty and rescue Pulaski, and Moriarty’s response is surprising. He doesn’t want to be a villain, he doesn’t want to hurt the ship. He simply wants to exist beyond the confines of the holodeck. He can’t, of course, and he accepts Picard’s explanation why. Daniel Davis’s portrayal of Moriarty is impressive and when he says “What I have seen, what I have learned, fascinates me. I do not want to die,” it takes you off guard. You give a crap. I enjoyed that moment with Moriarty, but I’m torn between that appreciation and my disappointment with the challenge between Data, Geordi, and Pulaski being so abruptly dropped. We don’t even hear from Data in the resolution of the episode even though so much attention is focused on him in the early half. I also have to say even though some might consider it a minor issue, I can’t shake this one silly little problem I have with the notion of the computer just presto, BAM, making Moriarty sentient. I understand why – because Geordi stupidly told the computer to make a bad guy who could beat Data – but exactly how did it do that? After Geordi makes the command, the show cuts to the bridge where Worf notices a power fluctuation, so okay, it used more power than normal. So? How does a computer, which is NOT sentient, create something that is sentient? Maybe it’s just a minor complaint, but considering we’re talking about a franchise that pats itself on the back for its scientific acumen, I think it’s a valid one. Scientist Bruce Maddox hopes to follow in the footsteps of Dr. Noonien Soong, the late genius who created the android Data. He approaches Data, Picard, and Riker with his plan, but none of them are convinced Maddox can do what he says. Data is worried he might die, or that at the very least his sense of self might be lost in the procedure Maddox proposes. He resists, but Maddox attempts to force Data to submit to the procedure by getting Data transferred under his command. Captain Picard turns to his former lover Judge Advocate General Philippa Louvois. When Data tries to resign from Starfleet to avoid coming under Maddox’s knife, Maddox claims Data is property and has no right to resign. 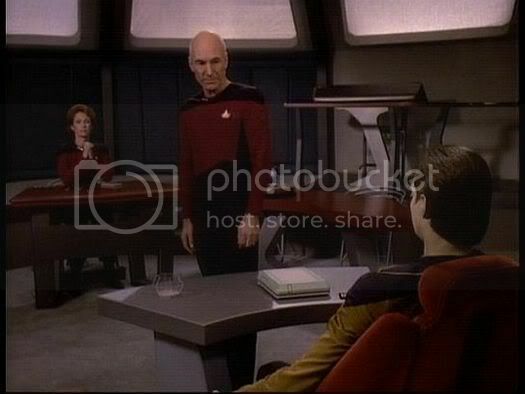 The matter is brought to a hearing before Louvois in which Picard represents Data and Riker is forced into the unfortunate position of representing Maddox. The issue of the hearing: Does Data have rights or is he property? It’s disarming how affecting I found this episode. I have issues with Data episodes and I won’t bore you with them now. Suffice to say I feel the question of Data’s humanity got very damn old. And before deciding to go through Alan’s list of episodes, I can guarantee if I was channel surfing and came across what looked to be a Data episode, I would’ve turned it right the hell off. To my surprise, I grew quickly irritated with Maddox’s insistence of referring to Data as “it” instead of “he.” When Riker shocks the hearing’s attendants by switching Data off and letting him fall over like a puppet, I was equally surprised with how obscene it seemed. Guinan’s speech to Picard about slavery is disarmingly rousing, and the speech it inspires from Picard even moreso. When Picard blasts at the Judge Advocate General, “Starfleet was founded to seek out new life; well, there it sits!” it sends chills. Overall the dialogue in this episode is truly powerful and memorable. My only problems with it are tiny irritations. I thought the dynamic between Picard and Louvois was annoying. And this happens to be one of the episodes that starts with the senior officers playing poker, and I just don’t get that. They don’t have money. How do you play poker in a society where there’s no money? How do you bluff if no one has money to lose? But again, those are teeny, tiny problems. Overall, it’s a great episode. The Enterprise reaches the edge of unexplored space and the enigmatic trickster Q reappears, claiming he’s been ejected from the Q Continuum and wants a position aboard Enterprise. Picard and his crew, Q claims, is simply not ready for what awaits them and Q offers to act as guide and protector. Predictably, Picard wants nothing to do with the troublesome entity and in retaliation Q sends Enterprise spinning light years away from home where they encounter the Borg for the first time. I watched “Q Who” when it first aired, and at first I wondered if Alan put this on the list because it was the Borg’s first appearance. I didn’t remember it as a particularly bad episode, but I didn’t remember it as a particularly good one either. I couldn’t come up with anything memorable about it other than the Borg. But as I watched it again, my mind changed. Even though it was the Borg everyone remembers from the episode, this is really Q’s show. And it’s unique among the Q episodes in that it’s the one time there’s no denying that Q really does make Picard and co. look just plain stupid. And it isn’t just because the Borg ship is faster or stronger than Enterprise. After trying and failing to communicate peacefully with the Borg, after Borg drones invade the ship and try to take it over, after the Borg try to steal Enterprise with a tractor beam and the two ships exchange fire, and after Guinan tells Picard and his officers, “Hey! The Borg wiped out my entire race. You really need to GTFO, dude,” what does the Enterprise do? The Enterprise sits motionless in space, staring at the Borg cube, while the senior officers have meetings. I also remember this was the first episode in which Guinan seemed interesting. Her nature isn’t clearly defined in “Q Who,” and I don’t know that it ever was, but we know she’s much more than she appears. We learn Q and Guinan have had dealings before and there’s a strong implication that Guinan is much more powerful than she seems. She doesn’t do anything to hurt Q or to protect herself from him, but she acts as if she could if she wanted to. My only complaint about the episode is that the annoying Ensign Gomez who spills hot chocolate all over Picard at the beginning of “Q Who” survives to see the end of it. I mean if the Borg aren’t going to kill the temp characters, what the hell good are they? Very pleased to see you came to TNG with an open enough mind to see what I really like about these episodes; The Big Goodbye I dig because it was the first TNG, I think, that really revealed important character elements rather than just throwing some sci-fi action at us. Elementary, Dear Data, Measure of a Man and Q-Who are all about important issues, not just Star Trek being about Star Trek, which is what the worst episodes of the series descend to. Roddenberry and Co. created a wondrous vehicle by which we could explore important questions and our own humanity, and that's what I find in the episodes I recommended. Really looking forward to reading more of these reviews! I liked you Top 10 reasons you dislike TNG, because a lot of them are true. Especially where you mention morality plays, the less adventurous compared to the original series, and you problems with the races. TNG doesn't capture the original's spirit because Roddenberry started to have a more self-important view of the franchise. That's why it's more preachy and at times takes a hypocritical view. As I mentioned before try Deep Space Nine. It strayed from the standard formulas of the rest of the "starship" series and built characterization and storylines.